The new replacement chain for the ever popular PC59. Always reliable chains and my go to spec for my 9 speed CX bike. A great balance of price and performance. SRAM Powerlink is a real positive feature too - its the reason I avoid Shimano chains tbh. I ride about 6,000 miles a year, and have been using either the 951 or 971 for last 4 years. Traditionally get about 2,000 miles before swapping out. I could get more from the chain, but prefer to save the chainring and cassettes. Excellent, as always for a SRAM chain. Love the quick-connect feature of Sram chains. Great price and smooth shifts so far ( 100 miles). Great bit of kit - preferred to Shimano which tend to snap in my experience. 1st time switch from KMC to Sram and only because I'm a bit strapped for cash at the moment but this just got me through my first coast to coast and ran sweet as a nut with the Sram PG980 cassette and Shimano M590 chainset. Good chain at a nice price. Just remember to keep it clean and well oiled. I always use sram chains. Look after them and they look after you! Good value long lasting chain all you ever need .. This is the ultimate chain. Cheap, extremely durable and it is Sram, so Power Link II included. I do about 1200 - 1500 km on them, before it reaches 0.75% usage mark. Decent chain with nickel finished outer links to ward off corrosion. Seems slightly more robust and tolerates breaking/joining better than shimano chains. Good quality for the price. Not very exciting but essential for any bike and i have always found SRAM chains to provide excellent performance and last a long time. I've never snapped a SRAM chain and the power link is the real bonus as it is so much easier to remove, fix or reattach. Very good, came at the exact length I needed too. Would recommend this chain. Perfect quality easy to measure and fits together very well. Great chain as always from SRAM so easy to seperate without a tool. This is by no means my first purchase from Merlin and will definitely not be my last! Always impressed with the great prices combined with great offers, fantastic service and fast delivery. Thanks Merlin! Item received in good condition, in a bag, not a box, but we were not bothered about that - easier posting. Bought to replace an identical chain which gave many years good service. Gold joining link supplied but we just used a splitter. Excellent service from Merlin's, delivered in just 2 days with the free p&p. Good value chain that is better than Shimano chains because it is joined with a power-link that can be easily removed and replaced for maintenance. Good solid chain at a competitive price. Arrived on time, wasn't in SRAM packaging but didn't care about that. Had this chain before from Merlin. Good chain at a great price, competetively priced too compared to elsewhere. Postage and delivery spot on as always. This is a good reliable chain with a quick link that makes taking it off for cleaning and maintenance of bike very easy. I would however recommend quick link pliers for quick removal....one of the most useful tools I have ever purchased and very cheap at that. The only chain I ever buy. Good quality at a reasonable price point. Very good chain and great value for the money. 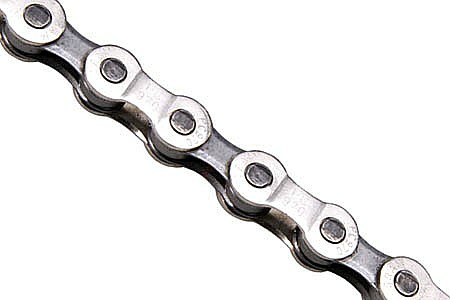 I change my Mtb-chain quite often and then is this chain my choise. Quick release link is perfect!